tennis Brothers — What happened since my last blog? What happened since my last blog? In my last blog I was playing the Winter circuit in Hilversum, Netherlands, after 14 matches over 4 weekends, I won overall. I won a nice shield. Next tournament was a doubles JRT ( Youth ranking tournament) which I went on to win. By that time I was number 1 under 16 in the Netherlands - bearing in mind that I was only in my first year. Christmas came where I had a great time with my family getting lots of lovely presents. After Christmas I had an easy week tapering down to get ready for my next challenge ITFs - ( ITF Tournaments ). WOW I couldn't believe it myself I was on a roll. I got into the semi final and I had to play the number 2 seed a girl from Ukraine, I won in 2 sets 7-5 6-2. Just think about this - I'm now into my first ever final, I had to play the number 3 seed a girl from Slovakia. From the start I played well and I won the first set 7-5, I thought to myself I can win this, 2nd set I'm 2-0 up when the girl retired. I had won my first ITF after coming through the qualifications, I couldn't believe it myself. I also got to the semi finals in the doubles. To say the least I was elated another final in 2 weeks. The final was against ranked number 5 from Slovenia but it was one match too much, I lost in 3 sets 3-6 6-3 6-4, I got to the semi finals again in the doubles. So after 2 weeks I had played 18 matches phew....and jumped into the top 700in the rankings. I must say I was very proud of myself. I now needed a rest. I was selected again, 2nd year running for the Winter Cup in Bergen op Zoom, we played Lithuania in the first round we won, next was Germany, I was up against a tough German so I lost, we now had to play for 3rd/4th place. We had to play Poland, I lost my single but won my double but overall we lost 1-2. Czech Republic eventually won. I played a few tournaments in Holland including the indoor National Championships under 16, in the semi final I didn't play too well and lost to the eventual winner. I was a bit disappointed but life goes on. There were no other tennis tournaments to play so I decided to play a TE 3 as it was organized by my own tennis academy Intime. I won all the rounds quite easy till the semi final when my wrist started to hurt, I won the first set 6-0 then I struggled, I couldn't hit the ball hard, I carried on fighting and won 7-5. I had some treatment for the next day. I played the final and won 6-3 7-6. I also won the doubles with the girl I beat in the final. I was now ranked 62 in the world. Next stop was two more ITFs grade 5 in Latvia with the Federation. Mid March till the end of March. I was now into the main draw straight away, thank goodness. I won the first 3 rounds easy after beating the number 2 seed, so I was now into the semi final. I had to play a girl from Estonia who had played the Fed Cup so,I knew it was going to be a tough match, I lost the first set but fought back and won 4-6 6-2 6-2. I was now into my third final. I had to play the number. 1 seed from Latvia, things didnt go to plan and I lost too easy. Doubles we lost in the first round. I was still climbing up the rankings. 2nd week in Latvia I was finally ranked number 7, first match was a tough one against a Russian which I won in three sets, eventually I got to the quarterfinals where I had to play the number 1 another girl from Russia, I took her to 3 sets but lost 6-2 3-6 6-7, I had a few match points in the third but it wasn't to be. In the doubles we got to the semi finals. May/June. The Netherlands play club competitions which I play for TC Zandvoort in first class seniors. During one of the club matches I suffered a shoulder injury. 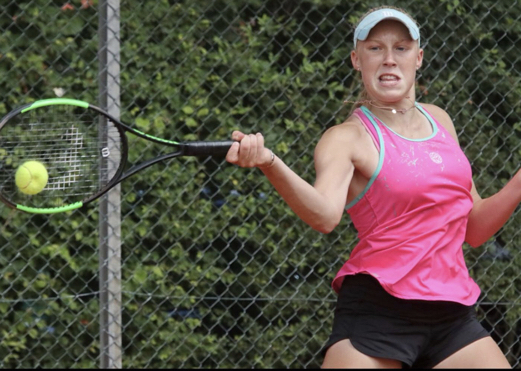 Beginning of June, I went to play in Estonia ITF Grade 4, I was ranked around 550 in the world. I was ranked number 7 in the tournament. I got through to the quarter final but just lost a tough match against the girl who eventually won the tournament. One day after I came back from Denmark I turned 15 years old. This was my very first Grade 2 I won the first round 6-7 6-2 6-2 against a girl who was ranked 127 in the world I played a incredible match. After that I had to play the ranked number one a girl ranked 73 in the world . Unfortunately it wasn't my best match. So I lost. I am now ranked 401 in the world. I have been selected to play the European Championships in Moscow and the Summer Cup in Romania. Results to follow in the next Blog.